Stay near the RiverWalk at our San Antonio HotelConveniently located near the City Convention Center and less than a mile from the RiverWalk, our San Antonio hotel provides easy access to all that the city offers. Whether you're in town for leisure or business, we have the outstanding amenities you deserve, as well as an ideal location.When it comes to meeting the needs of corporate travelers, we exceed your expectations with perks such as a 24-hour business center with free HSIA, copy & print services and a computer. In addition, our property is just a mile from the San Antonio Convention Center, and we are close to businesses like Toyota, AT&T, H.E.B., Coca-Cola and Frito-Lay.Our hotel in San Antonio is a leisure traveler's paradise, too, as it's close to the area's best attractions, including Rivercenter Mall and the historic Alamo. Our location also offers you several activity options, such as shopping at the North Star Mall, catching a game at the Alamodome or AT&T Center, exploring the RiverWalk or making the short dive across town to spend the day at SeaWorld.If you're looking for hotels in San Antonio, be sure to choose ours for the great amenities. We offer free parking, a free, hot Breakfast Bar, an on-site fitness center and free shuttle service to the Convention Center, and Rivercenter Mall. 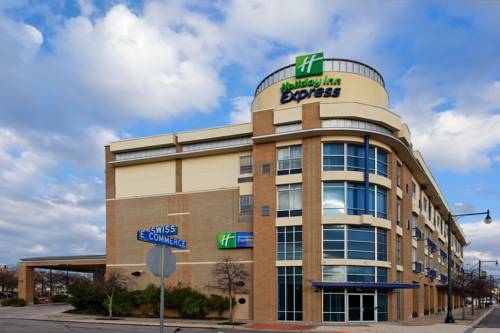 Make the smart choice and book your room at the Holiday Inn Express San Antonio Rivercenter Area hotel today. Italian Grill located in an old train warehouse, complete with indoor cable car. We also have beautiful vintage decor. A great place for Fajitas and Margaritas! 1100 square feet of flexible meeting space with seating for theater style up to 80, classroom style up to 45, and banquet up to 60. Children's program - Located just a few short blocks away is the San Antonio Children's Muesume. For conventioneers and group meeting attendees. Rivercenter is a welcome diversion from the work at hand. ~1 miles from San Antonio. ~20 miles from San Antonio.